Meet four Georgia physicians and a hospital administrator who have donated their time and skills to make the state a healthier place. This year’s Healthcare Heroes can trace to their youth a passion for their professions, and their generous contributions of time and talent have meant better healthcare for their communities, their state, and even the world at large. A rural doctor who spent his youth as a migrant worker has devoted his life to serving the underserved. The CEO of a 25-bed hospital in a poor region of the state was quite literally born to her job. A physician who offered his surgical skills on more than 20 trips to poverty-stricken south India leads the effort to give that part of the world a 500-bed hospital – and hope. A cardiologist who found his calling in athletics and medicine married the two to become noted for his innovations in preventing heart-related disasters in Georgia’s sports arenas. And a radiation oncologist takes a larger look at the treatment of cancer. Sometimes when Dr. Raymond Moreno is driving by a field of migrant workers harvesting a crop, his mind is flooded with the unpleasant memories of his childhood. 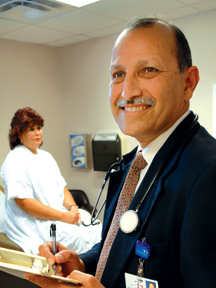 Where Moreno is now is Tifton, serving as vice president of medical affairs at Tift Regional Medical Center. On his journey from the vegetable fields of Florida, Moreno became a student, then a pharmacist, then a doctor specializing in internal medicine and now is a full-time hospital administrator. In his 20-plus years as a Tifton physician, Moreno has served in leadership positions with local, regional and state professional organizations. He also has made presentations on migrant healthcare to a wide range of groups. Moreno has devoted his personal and professional life to providing healthcare for migrant workers and to getting their kids out of the fields and into the classroom. In the 1990s, he led the effort to obtain funding for a migrant workers clinic where he volunteered his time and talents. The clinic still serves the migrant worker community in southwest Georgia. It was Moreno who helped convince the Goizueta Foundation to establish the Scholars Fund at Tifton’s Abraham Baldwin Agriculture College, to provide scholarships to students of Hispanic descent. Moreno and his wife, Kathy, also established a migrant scholarship fund at the school. At a time when rural hospitals are struggling to keep their doors open, South Georgia’s Bacon County Hospital (BCH) has embarked on an expansion program and is spending millions on a technology upgrade. Even more impressive is the fact that one-half of BCH’s fulltime medical staff of eight is homegrown, thanks to a local scholarship program. Under Turner’s leadership, the 25-bed hospital has found imaginative ways to raise cash for badly needed improvements. Built in 1952, BCH had a four-bed intensive care unit in which patients were separated only by curtains. But a $14.2-million expansion program is bringing the Bacon County facility into the modern era. Funded by two local banks, the project gets under way next year. “The banks looked at our financial statement and felt that due to our success and our financial condition it was a good project to fund,” Turner says. Further modernization came when the Federal Communications Commission (FCC) approved a $2.2 million grant to install a fiber-optic line and purchase equipment for a technology upgrade. “We have gone totally digital in our X-ray department,” Turner says. BCH took the lead in forming a technical network with several other hospitals to introduce electronic record-keeping to this rural area of Georgia. “I feel that rural Georgia deserves the same quality of healthcare that you can get in Atlanta,” Turner says. Turner’s passion for improving rural healthcare led to her election as chair of the Center for Rural Health. In that capacity, she lobbies legislators in Atlanta and Washington to improve health services in less populous areas. Her passion, she says, has been with her since the day she came into the world. For Albany physician Van Knowles, service to others was a legacy handed down from his father, an Army chaplain who died in the Philippines during World War II. “I never knew my daddy,” Knowles says. But a 1945 letter from the elder Knowles to his 5-year-old son predicted the boy would someday be a doctor who used his Methodist faith to serve others. And Knowles has fulfilled his father’s prophecy. That was more than 20 years ago, and Knowles has since returned to the South India region some 20 times. The church mission evolved into the Southwest Georgia Medical Mission Team Inc., a nonprofit that has grown to 12 members, including medical professionals and a pastor. Since 1995, the Knowles-led mission team has raised funds and secured medical supplies to treat elephantiasis, malaria, Dengue fever and a host of illnesses born of filthy water, oppressive heat and little access to healthcare. The team has sent money for new wells and electric generators. But its crowning achievement is a 500-bed hospital in Karakonam, South India, that is home to the Van Knowles Surgical Complex, as well as nursing and medical schools and a staff of 500. That, Cantwell says, “is a pretty good goal to strive for – to leave a legacy like that.” Cantwell, whose son represents the fourth generation of family doctors, has conducted his professional and private life in such a way as to live up to the standards set by his grandfather’s eulogist. With such credentials, Cantwell, a former Duke University basketball player, was a natural choice as chief medical officer for Atlanta’s 1996 Olympics, where he served with distinction. Cantwell sees patients in his Atlanta office at Cardiology of Georgia, PC, and is affiliated with Piedmont Hospital. But, to the gratitude of his patients and cancer researchers everywhere, fate guided Mumber into the study and treatment of cancer. His work in that field has earned him widespread recognition, most recently as the 2008 recipient of the Georgia Cancer Coalition’s Hamilton Jordan Founder’s Award. In 2002, Mumber received a fellowship in an inaugural program for the study of integrative medicine at the University of Arizona. The experience taught him something was missing from the integrative discipline. “It was obvious there weren’t any significant resources, from an academic perspective, on how to incorporate the look at the whole person, to look at the different modalities [and] to address the whole person.” So Mumber assembled 20 contributing writers and published Integrative Oncology: Principles and Practice, a medical textbook. Mumber was a founder of Cancer Navigators, Inc., a nonprofit that offers cancer patients in three northwest Georgia counties access to supportive services. He also organized a partnership in Floyd County to help develop a statewide evidence-based cancer quality measurement program. Mumber says his passion for improving care is rooted in the childhood memory of his mother’s struggle with breast cancer. “She’s doing great now,” he says. But at the time “cancer” was a word that was whispered. “I was raised a Catholic, and I guess I always felt like I had a calling to do something in a more counseling or priestly role,” he says.